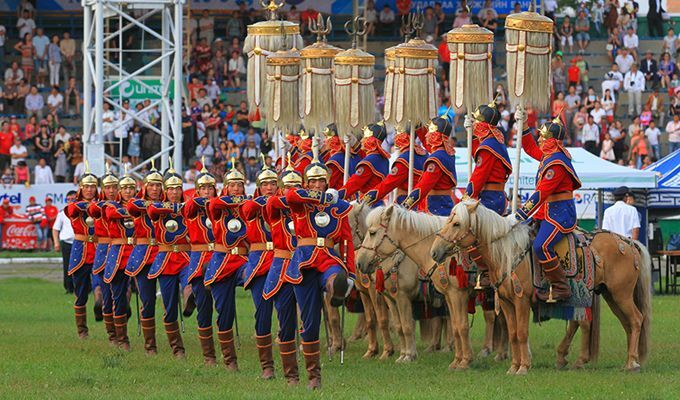 Naadam is the most famous, interesting festival and national holiday of Mongolia attracts worldwide attention. Origin of the festival dates back to the great warriors’ period or great Genghis Khaan’s period of the 13th century. 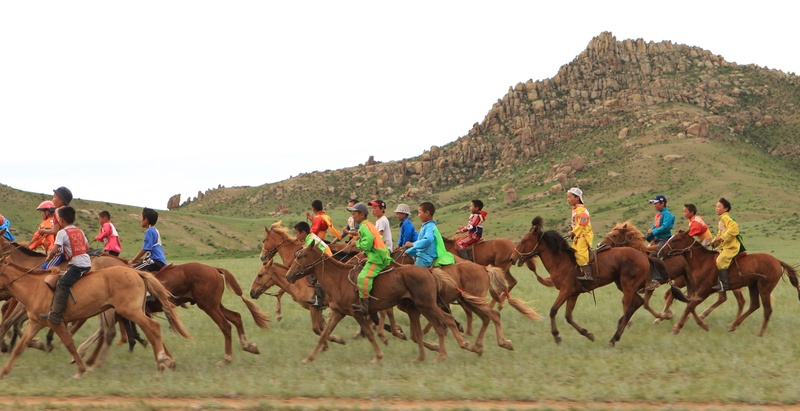 Naadam means “Festival or feast of sports”. 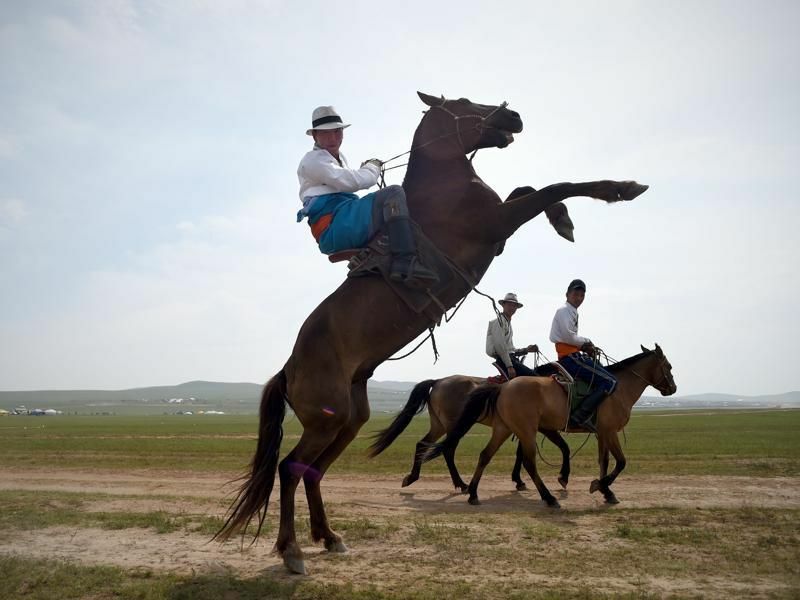 As well as, the festival is locally termed “Eriin Gurvan Naadam” means “Three manly sports”. The three sports are: Horse racing, wrestling and archery. Ancient times, the Mongolian great kings and military generals used to train their warriors and the warriors’ main battle tool horses while competing and feasting those three manly traditional sports have been generating for centuries and being enriched by more traditional sports and games. During the festival, Mongolians dress in colourful and distinctive traditional clothes and ride their most beautiful horses. Official festival celebration takes place through the country between 11 and 13th July annually. Particularly, the Naadam celebration in Ulaanbaatar, a capital of Mongolia is the most marvellous and involves wider range. There are 21 provinces and their 333 soums (small administrative divisions) in Mongolia celebrate their own festivals. Even though, some of the administrative units celebrate their festival on different dates depends on special celebrity occasions or anniversaries may held certain periods. As well as, celebrating the festival on different dates than the big festival celebrated in Ulaanbaatar allows their local wrestlers, archers and race horses to take part in big competition and celebration. 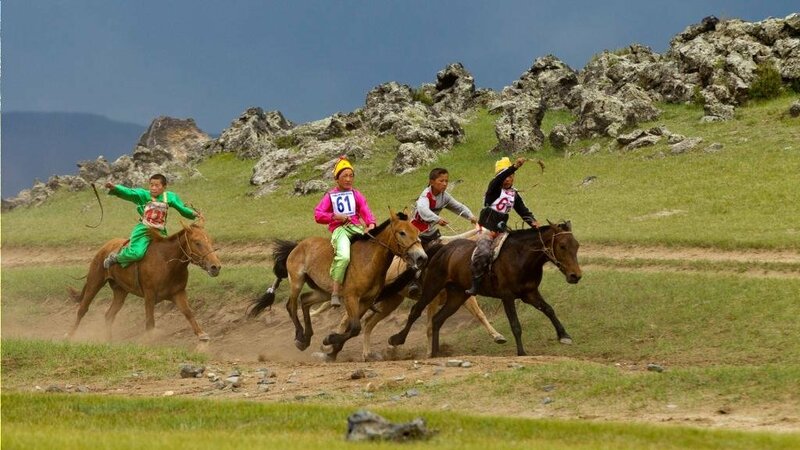 Annually, thousands of tourists head to Mongolia to attend this breathtaking event except for hundreds of journalists broadcasting the celebration worldwide. This is not only festival and holiday for Mongolians, this is a day proud of their tradition and unique way of nomadic culture. 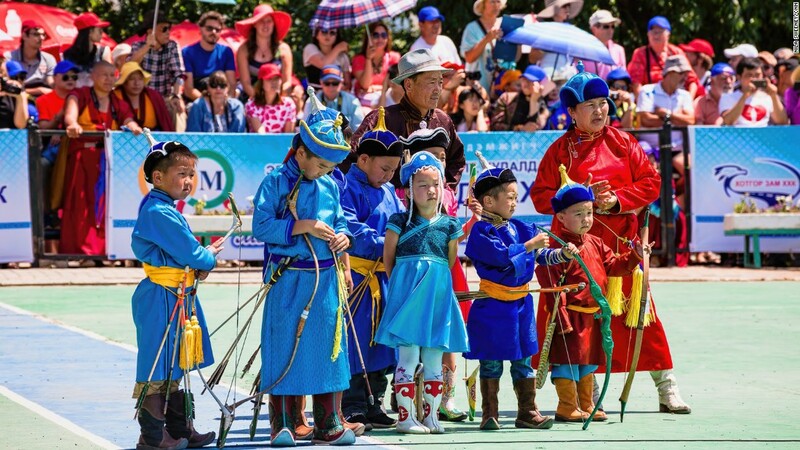 The Naadam festival in Ulaanbaatar allows its audience to admire colourful celebration and see prominent sports while the countryside festivals allow their audiences to participate and deal with locals. The Ulaanbaatar Naadam starts with a parade of horse soldiers transferring the symbolic “nine banners of the Great Mongol Empire” from the Government house to Naadam stadium. Next, Mongolian president give a speech followed by traditional performances, shows and much more. 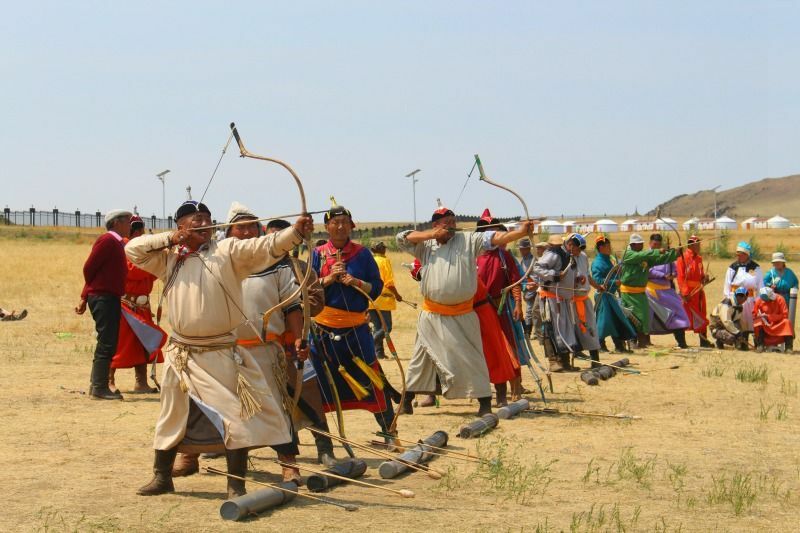 During Naadam days, there are plenty to see including wrestling, archery, anklebone shooting and horse races which held in the open fields outside of Ulaanbaatar, exhibitions, folklore competitions, souvenirs, food and drinks. Wrestlers wear special clothes to show the beauty and strength of their bodies. There is no categorization according to weight. The basic rule of the wrestling is the number of wrestlers must be equal: 512 or as many as 1024 during special anniversaries. The higher-ranking wrestlers choose from lower ranking wrestlers as their competitors. The winners remain for the next round whilst the loser leaves the competition. The competition will continue in this manner until the very last round. Depending on which round the wrestlers win and also depending on their previous title, they receive a new title. The competition becomes more and more interesting round by round as the winner wrestlers receive titles after the fifth round and further. The wrestlers’ titles named after prey of birds and strong animals; falcon, elephant, hawk, garuda, lion and champion. The wrestlers’ imitations of the animals’ gesture are of an interest as well. 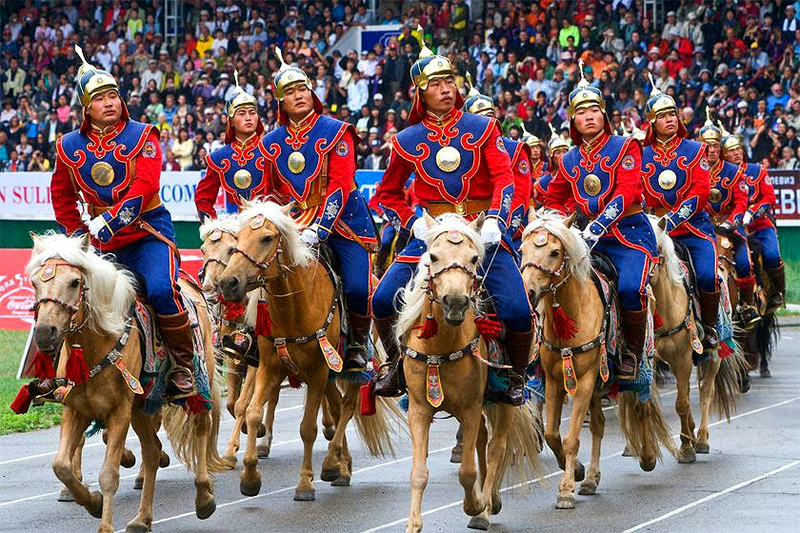 Over the years, there are some changes for the Naadam festival rule. Nowadays, women can attend most competitions and games except for wrestling. This competition is open to women, who draw 20 arrows at a 60 meters target, while men shoot 40 arrows at a 75 meters target. Combining the festival tour with a visit to the vast expanses of the Gobi provides you a nice escape from the buzzing cities. 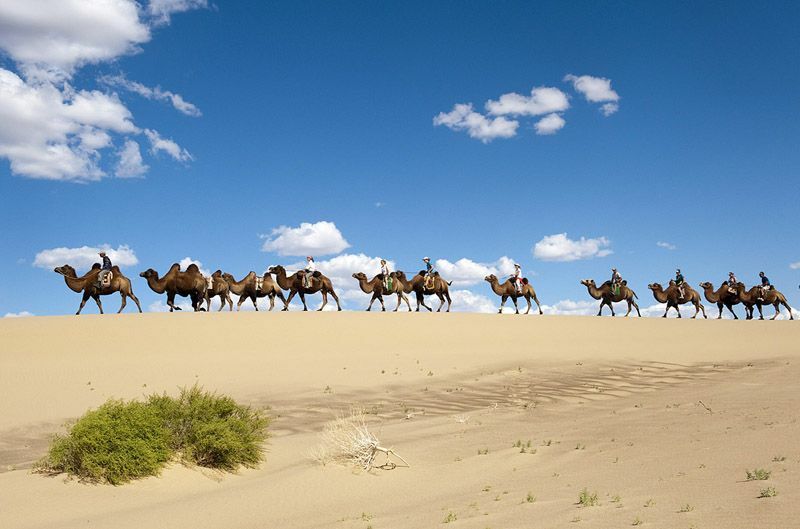 Leave behind all your modern day frustrations while immersing yourself in the beauty and purity of the Gobi landscape. The Mongolian Gobi is the least populated area in the world but has a lot see and experience ranging from endless steppes edges with the horizon, spotless blue sky during daytime and bright stars at nights, the world rare two-humped camel riding experiences, natural scenery, nomadic life and more. 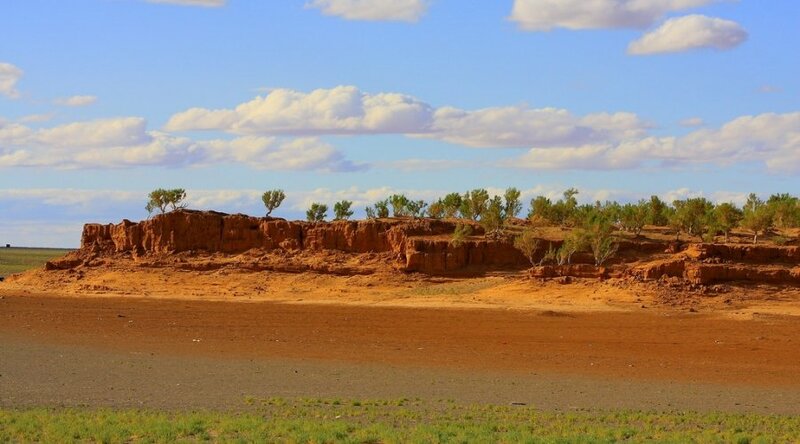 You may know that the Gobi is in the world attention due to its beauty, its uniqueness, its abundant mineral resources, and by dinosaur fossils. You can choose other tours from tour packages and we will be flexible for creating tour for your interesting. Your guide and driver meet you at the airport/ the train station guide and transfer to a hotel (early check in is subject to some additional fee). After some time embark on a city sightseeing tour if the time permits. First, we will visit Gandantegchilen Monastery. 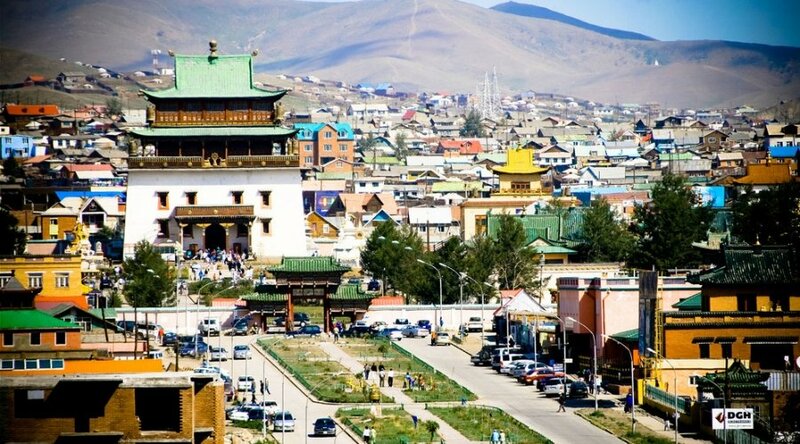 The monastery is a favored place for locals as well as foreigners due to its interesting religious artifacts and peacefulness.Next, visit the Central Square and attend traditional cultural performance which is one of the most interesting and must see things in Ulaanbaatar. The Festival starts with a transferring ceremony of the nine white banners from the Government House to the Naadam Stadium followed by a horse parade. Genghis Khaan used to use the nine banners during festive and peaceful times. Next, the magnificent opening ceremony starts. Traditional wrestling, archery and horse race are main highlights of the festival. 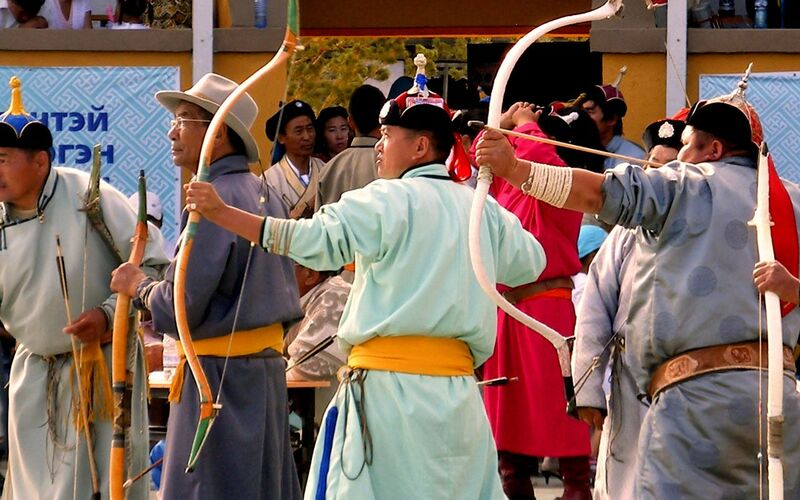 As well as, you will see anklebone shooting and Naadam trade starting from Naadam main dish Huushuur, souvenirs, traditional clothes and much more. In the morning, drive to the horse racing area. The horses race on the open steppes by age category (6 ages): from two-year-old horse to full-grown stallions. The racing distance depends on horses’ age. For example, two-year-old horses race 15 km, while the full-grown horses race 30km in the open field. Today, we can have a choice of 4 years old horses’ race or 2 years old horses’ race. 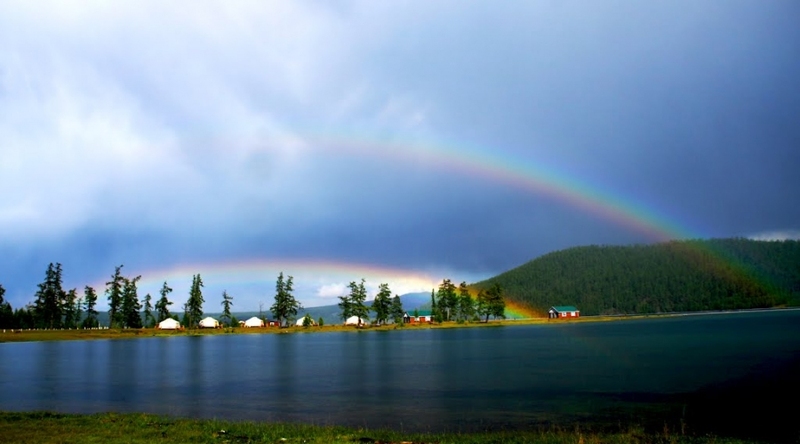 In the afternoon, we will drive south of Bogd Khaan Mountain and have an overnight at a ger camp. The journey continues to Tsagaan Suvarga driving on paved roads of the Gobi steppes. 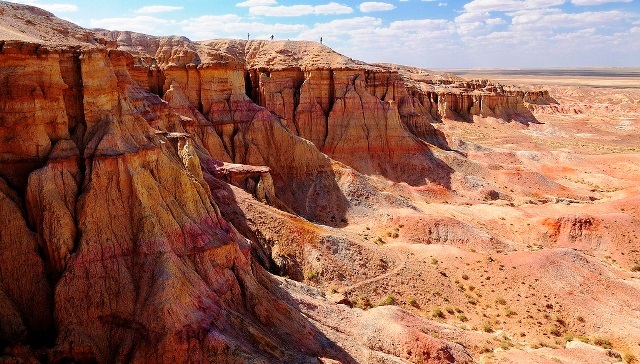 Tsagaan Suvarga is 20-60 m high, 400 m long colorful clay cliffs. This mud could be found in the bed of the ocean three million years ago. At the sunrise and sunset, the cliffs look wonderfully colorful. Hike through the cliffs. Eagle Valley is one of the most beautiful valleys in the Gobi Gurvan Saikhan Mountain. In the depths of the valley, sheer canyon does not accept sunlight. People are always amazed when they see this beautiful green valley in the Gobi desert. If you are there at the right time, you will have a chance to see wild animals such as ibex, mountain sheep and deer. In the morning, when the upper parts of the canyon accept the sunlight, golden eagles can be seen flying from their nests. The valley was named after these birds. Seeing the Eagle Valley requires us approximately 2.5 hours soft hiking through the beautiful mountain valley. You will be amazed by the combination of rugged blue mountains, yellow sand mountains and a green shored river while driving to the Khongor Sand Dunes. 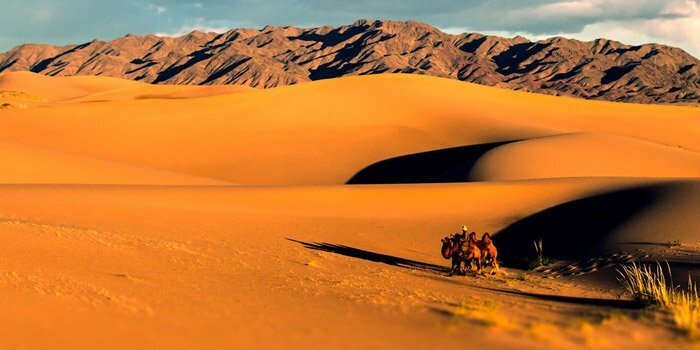 The Khongor Sand Dunes are the largest and most spectacular sand dunes in Mongolia. Also known as "Singing Dunes," they are up to 300 m high towering above the surrounding area. Total width is 5-35 km and about 100 km long. The tops of the dunes are accessible, and the views of the desert from the top are indescribably beautiful. If you can climb one of the highest tops, you probably find out why the sand dunes called "Singing Dunes." Next, we will visit a nomad family and have some camel riding. Our adventure will continue to the Flaming Cliffs, where American explorer Roy Chapman Andrews found the cemetery of dinosaurs and the first dinosaur eggs ever discovered in the world. 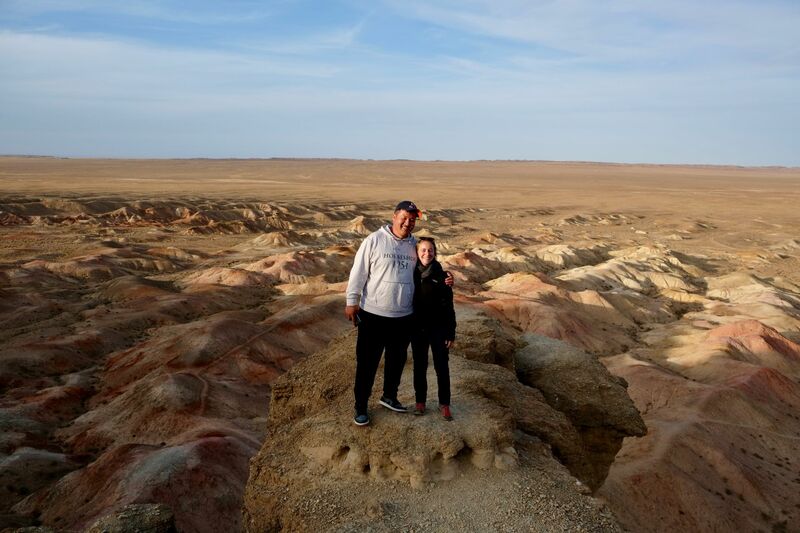 We will have some hiking through the cliffs and see the Gobi tree grove in Bayanzag. Bayanzag means “rich in saxual trees.” This tree only grows in the Central Asian Gobi. 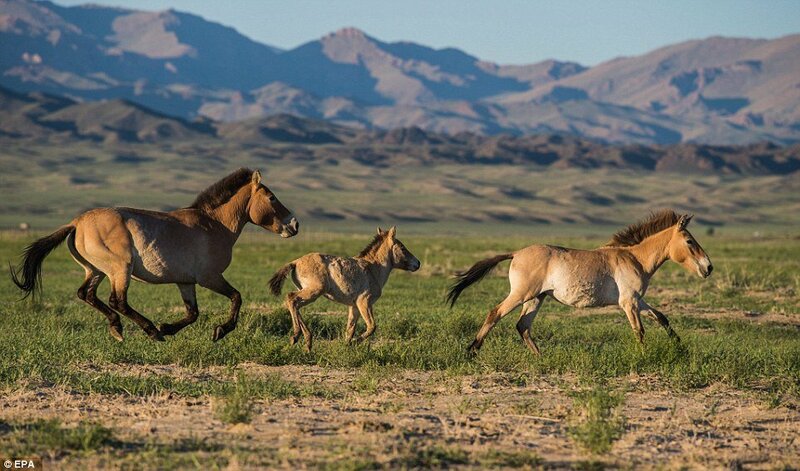 Enjoy 360 degrees views of the steppes, Gobi sunrise and sunset. 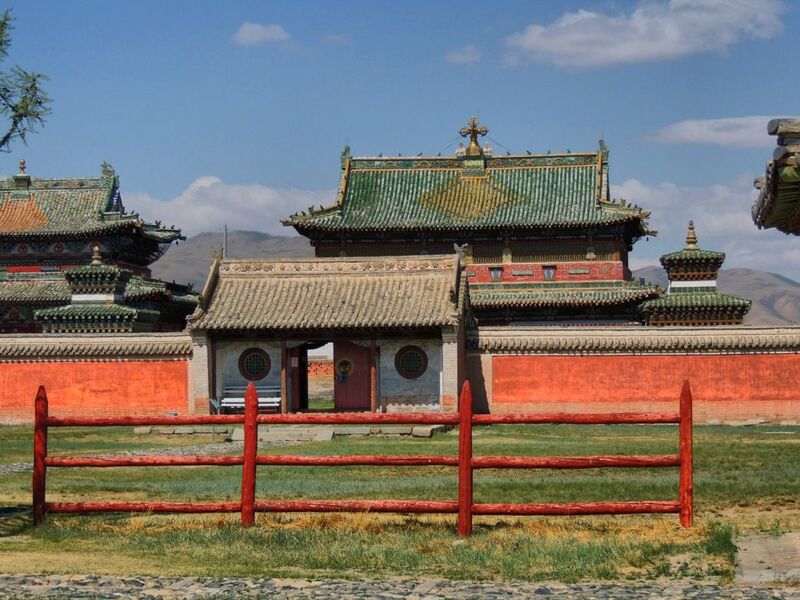 Ongi monastery was one of the biggest 7 monasteries in Mongolia. 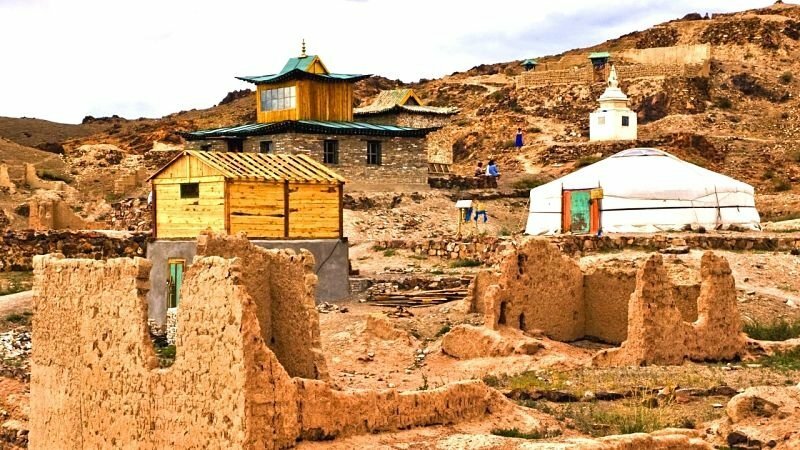 There were two monasteries consisted of more than 30 temples on the shores of the Ongi River surrounded by the Gobi mountains. The temples were destroyed during the socialist purge of the 1930s. Now the ruins of the monasteries involve a vast area. Visit a new active temple, a temple museum and hike through the old monastery site. 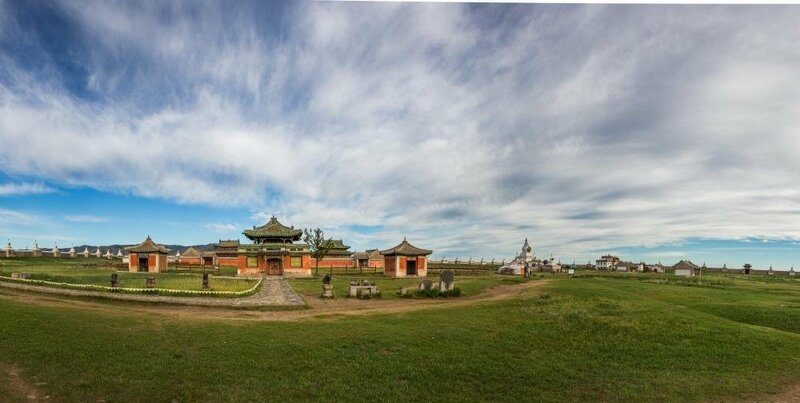 The monastery was built on the ruins of ancient Mongolian capital Kharakhorum (13th century) using old materials of the destroyed city without using a single nail for the construction. Kharakorum was one of the stops of the famous "Silk Road." Erdenezuu is the first and the largest monastery in Mongolia keeping religious masterpieces of the 17th - 20th centuries. See some valuable religious items in the temple museum and admire its stunning architecture. Also, seeing some remains of the ancient city and visiting the Kharakhorin Museum is a part of our today’s program. 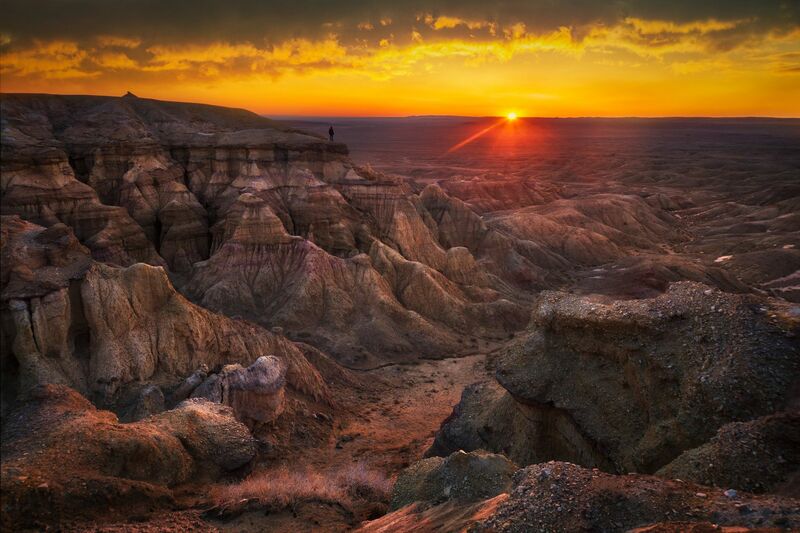 Amazing nature in Semi-Gobi. Imagine a picture that consists of rocky mountains in the back, sand dunes in front, green trees in and aside the dunes, a river flowing along the dunes. That is what Semi-Gobi looks like- everything in one package. Explore Semi-Gobi. Horse Riding. Will see wild horse on the way. End of the trip.